As you will see from the following article, it is one of many describing findings from the latest research and studies related to galactic cosmic rays. 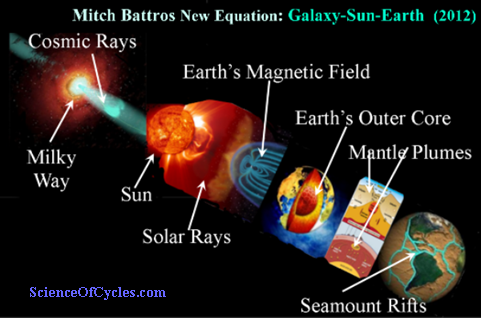 What I find to be a bit perplexing, is the amount and method of delivery from the science community regarding cosmic rays. 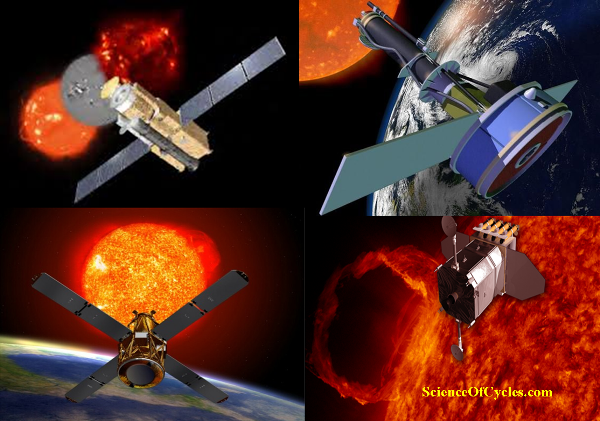 It would appear scientific data is coming in at record pace via the incredible spacecraft such as HERSCHEL, PLANK, CHANDRA, and WISE, and researchers are hard pressed to disseminate their findings in published papers. 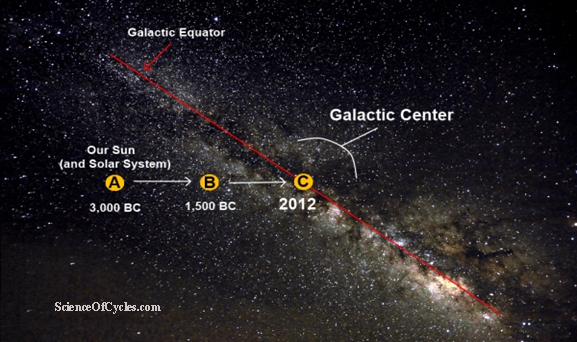 As related to my research on the Galaxy-Sun-Earth connection published in 2012, it appears to have hit almost every note presented, however, apparently I under estimated the foretelling possibilities galactic cosmic rays could have on Earth. There is quite a bit of data flowing out, much of which has to do with recent discoveries indicating supernovae explosions hitting Earth; and was the source of at least two ‘mass’ extinctions, and very likely the source of ‘partial’ extinctions. There is a great deal to present to you so this will be a 3 or 4 part article with this as Part-I. Below is one of the latest published findings showing the desire to, better and perhaps quickly, understand the pre and post eruptions, and most importantly, the rhythmic cycles. Astronomers have uncovered the strongest evidence yet exhibiting an enormous X-shaped structure made of stars that lies within the central bulge of the Milky Way Galaxy. Previous computer models showing observations of other galaxies – including our own galaxy Milky Way, suggesting the X-shaped structure does exist. However, no one had observed it directly, and some astronomers argued that previous research pointed indirectly to the existence of the X, but that it could be explained in other ways. Lead author is Melissa Ness, researcher at the Max Planck Institute for Astronomy in Heidelberg, along with Dustin Lang, research associate at the University of Toronto’s Dunlap Institute for Astronomy & Astrophysics, and co-author of the paper describing the discovery. 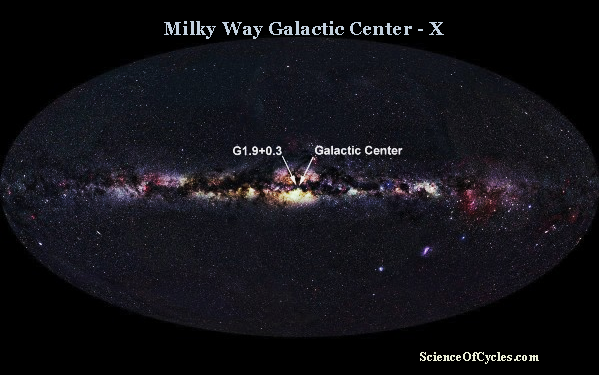 Lang says: “Controversy about whether the X-shaped structure existed, but our paper furnishes an authoritative composition of our own Milky Way’s galactic core. The results appear in the July issue of the Astronomical Journal. 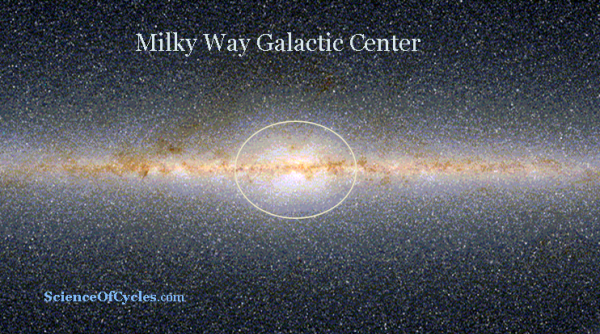 The Milky Way Galaxy is a barred spiral galaxy; a disk-shaped collection of dust, gas and billions of stars, 100,000 light-years in diameter. It is far from a simple disk structure, being comprised of two spiral arms, a bar-shaped feature that runs through its center, and a central bulge of stars. The central bulge, like other barred galaxy’s bulges, resembles a rectangular box or peanut as viewed from within the plane of the galaxy. The X-shaped structure is an integral component of the bulge. 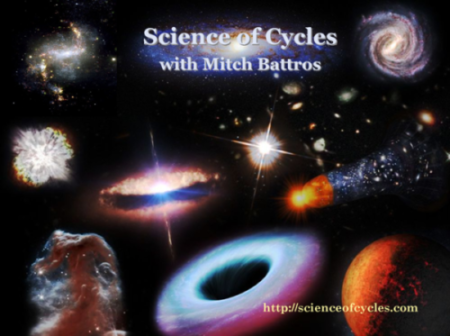 *** Be part of keeping ‘Science of Cycles’ alive and free. Your support is needed to keep this unique and valuable resource. Help sponsor us with your pledge as you see fit to the value you receive from our news service.